Heat oven to 450°F. In oven, melt 2 tablespoons of the margarine in 13x9-inch (3 quart) baking dish. Place fish in melted margarine; turn to coat. Sprinkle with lemon juice, salt and pepper. Bake at 450°F. for 5 minutes. Remove from oven. While fish is baking, in large skillet, melt remaining 1 tablespoon margarine over medium-high heat. Add garlic; cook until lightly browned. Add all remaining ingredients except Parmesan cheese. Cook and stir 5 to 6 minutes or until vegetables are crisp-tender. Spoon hot vegetables in center of baking dish, moving fish to ends of dish. Sprinkle with Parmesan cheese. Return to oven; bake an additional 3 to 5 minutes or until fish flakes easily with fork. Orange roughy is a New Zealand fish with firm white flesh and a very mild flavor. It's also low in fat. 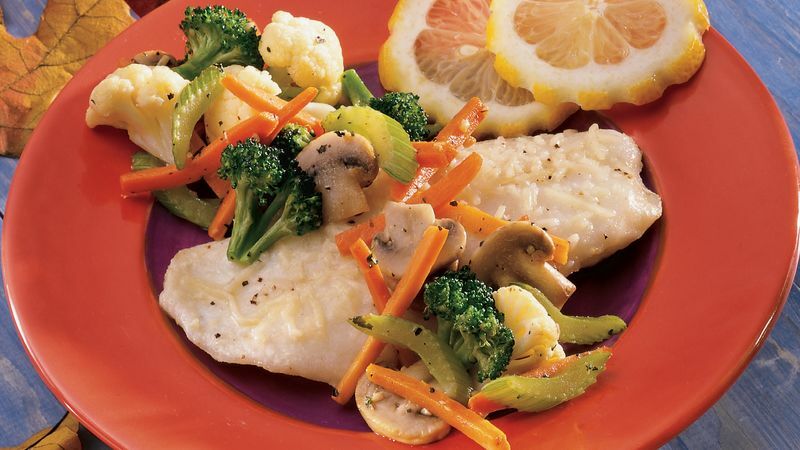 Any white-fleshed, mild-flavored fish such as flounder, haddock or whitefish can be used in place of the orange roughy. One pound of frozen wrapped fish will thaw in the refrigerator in about 24 hours. To quickly thaw frozen fish, place the fish in a tightly sealed plastic food storage bag; place in cold water, allowing about 1 hour thawing time per pound of fish.